Finished Corto Maltese: Ballad of the Salt Sea today. Took me forever and a day since I'm only reading it at work. Amazing though -- there are few things I've ever bothered to read four times in my life, and yet I'm still loving this work as one of my absolute favorites of all time. I had less patience for the first half this time around, but once it developed its depth towards the second half, I was hooked all over again. Corto Maltese may be the rougish prototype for Han Solo, but he's also so much more -- he isn't craving action and adventure, he's just trying to get as far away from civilization as possible. And every time those gulls fly by, both he and the reader are prompted to consider the absurdity of their frantic madness, viewed from a peaceful distance. It's just brilliant. I was going to move on to trying new graphic novels this month, but now that I have the taste in my mouth, I think I'm just going to continue with the rest of the Corto Maltese volumes instead. There are two new-to-English volumes out that I'd like to read after making my way through the four I own. I also started reading Laika with my daughters last night. Not sure they'll stick with it, but I could tell my 8 year old was impressed by how much subtlety it contained. She's used to graphic novels being a straight-forward medium, but I stopped to ask her to consider the understatements occurring in each panel. Finished Corto Maltese (vol. 2): Under The Sign of Capricorn this morning, and I got a lot more out of it than I did when reading it the first two times. In the past, I've only been able to see it for what it wasn't. It doesn't carry the depth and dramatic power of the second half of Ballad of the Salty Sea, but I can now see that it's because Hugo Pratt is striving for something different here. He doesn't want to make strong commentaries anymore; he wants to write adventure stories, and so this volume is so much more sophisticated in its art (even if the action sequences still leave a lot to be desired at this point), and the supporting characters and backdrops are so much more well developed. 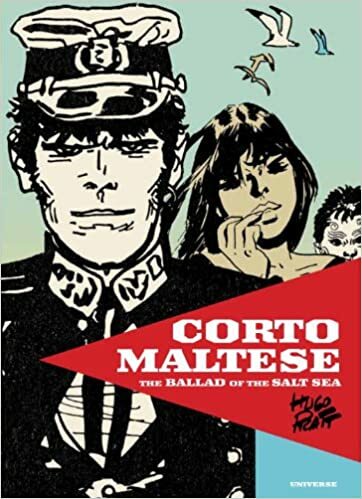 Whereas Ballad of the Salty Sea was trying to comment on humanity in general (or at least Western Civilization), these are now the stories of everywhere Corto goes outside of that civilization, and the myriad of peoples and places he encounters as a result. Tristan Bantam and Professor Steiner, the only two Westerners in this volume, are the least compelling of the bunch. But we meet countless other characters here, far more than in Salty Sea, and each resounds with unique personality and backstory. It's quite impressive. While we get more backstory on Corto Maltese as well, he is now less interesting than these strangers and strange places he encounters. He's still fun, but we already know what drives him and makes him tick from the first volume. It doesn't move me as much as the second half of Salty Sea (and I doubt any subsequent Corto Maltese volume ever will), but these characters and places are far more substantial/memorable, even as we fast-forward through them at a far quicker speed, and Pratt's art is truly growing in sophistication to the point that it's almost cinematic at times. I really enjoyed this volume more this time around. On some levels, it isn't Salty Sea. On others, it's far superior. Finished up my third reading of Corto Maltese: Beyond the Windy Isles tonight, and I'm sorry to say that, while Under the Sign of Capricorn (vol. 2) grew on me this time around, Beyond the Windy Isles (vol. 3) actually got a little worse. Whereas each episode in the previous volume developed rich characters and settings, all while fitting into a larger overall storyline, these episodes are almost entirely unrelated beyond geography and sacrifice characterization and setting for complex mysteries that don't pay off satisfactorily by the close. The first two stories are utterly weighed down by these qualities, the third (Voodoo for President) is decent, and the last two (Sweet Dream Lagoon, and A Tale of Two Grandfathers) prove to be the saving graces of this volume, both driving home powerful emotions and commentary on Western society. 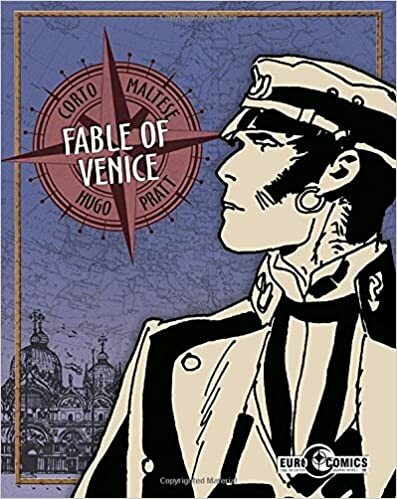 There's no such thing as a bad Corto Maltese story (at least as far as I've read), but I could have done without the first three of the five stories in this volume. Corto Maltese (vol. 4): Celtic Tales confuses me a lot more than it did the first time I read it. This volume is so different from the others, and I can't decide if it's bad fan service or great storytelling. All throughout the series thus far, Corto has been avoiding Western Civilization at all costs, but now the search for El Dorado has brought him to Venice in the middle of WWI air raids, and this somehow prompts him to take an active role in the war, initially under the guise of profiteering through arms dealing and later as a straight out hero who wins a medal of valor from the British crown, only to continually encounter signs that war is senseless so that he has reverted to type by the end of the volume, an observer remarking that he never changes. The journey can be seen as deep and purposeful, except that Corto lacks self-awareness to the extent that it's really hard to know how intentional this character arc is. Maybe Pratt just wanted Corto to fight in WWI and be a superhero in the process, taking on German spies and even being backed by the supernatural mythic beings of British lore in one particularly outlandish installment. I really really can't tell whether this volume came close to jumping the shark or if Corto, himself, did. As always, Pratt's art continues to evolve into its own brilliant style, and the stories are thoroughly engaging, but whether this is a series of unrelated stories that are thoroughly out of character for Corto, or whether this is a thoughtful and purposeful piece weaving together a consistent narrative of Corto finding his beliefs blurred and distorted by the war, is really up for debate. After three volumes of wandering, I feel like Pratt finally achieves a balance with this volume in which characterization (both for primary characters and for entire groups and races of people in the backdrop) take center stage over the action itself. It's fun, funny, and exciting stuff. The bold substance of the original volume is still lacking here, but Pratt isn't trying for it either. These are just the fun and action packed adventures of an expatriot looking for himself amidst a world of strife. Interesting too that, after getting overly involved in the war last volume, we find Corto understanding himself less than ever here. He is much less sure and collected than in previous volumes. Interesting to see subtle repercussions from the previous volume. Well I guess this became shaxper's Corto Maltese Quest as opposed to shaxper's Graphic Novel Quest this month. My colleague who borrowed Ballad of the Salt Sea returned it today and was eager to discuss it. He predicted the Monk's identity, loved the characterization and style, and we got into a particularly fun conversation about what the seagulls flying by symbolize. As he does not read comics and (like myself) is an English teacher, I feel like I opened his world a little wider with this -- he now knows there are graphic novels of substance out there, and I look forward to putting more of those in his hands in the future. Well the event is nearly a year old now, but as I'm still on my fourth re-read through the series, I felt my first encounter with Fable of Venice belonged here. Inevitably, I'll read and re-review the series a fifth time in 2018. This was the first volume that really wasn't working for me for the longest time. An overly complicated mystery that really didn't compel me, lots and lots of talking heads discussing the clues surrounding said mystery, and some of Pratt's least impressive artwork to date (it looked rushed). And yet, the end of this incredibly brief volume really got to me. When Corto broke the fourth wall, I rolled my eyes at first, but his ensuing explanation of the importance of magic, mystery, and lore to Venitians under fascist rule really spoke to me and lent a greater weight to all I'd just read. Still possibly my least favorite volume yet, but most volumes get better for me in the re-readings. I see in Corto Maltese the same problem as with the Star Wars series. The first installments were more to the point and told a story first and foremost, even if the mystical lore and historical context that Pratt used added a lot to the general mood. With later episodes, the author seemed to fall in love with his own cleverness and focused less on plot and more on context, exploring in details things that worked better as ill-defined supporting material. It didn’t make the latter books bad, by any means, but it made them feel like unneeded extensions to the original saga (which I would loosely define as what Pratt published in the 70s). There were a few bright spots toward the end (I enjoyed Tango, for example) but most of the latter books feel like overhearing a conversation between Pratt and Umberto Eco while stuck in an elevator. You learn interesting stuff, but you don't hope it will go on forever. I don't think anything will ever surpass Ballad of the Salt Sea because it was absolutely a graphic novel, with a clear beginning and ending, Pratt displaying tremendous love for the characters and storyline. The rest just sort of ambles along. I think it's all still very very good stuff, but Pratt told the story he needed to tell and now just seems like he's trying to use Corto Maltese as a vehicle for exploring new ideas and stories instead of seeing Corto Maltese as a story that, in and of itself, needs to be told. Pratt is good enough that I consider even his weakest volumes worth reading multiple times, but you're right -- there's no going back to the original. most of the latter books feel like overhearing a conversation between Pratt and Umberto Eco while stuck in an elevator. You learn interesting stuff, but you don't hope it will go on forever.